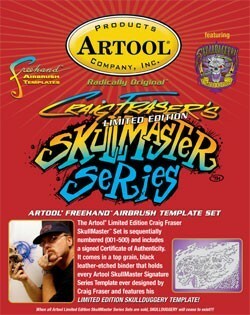 Artool has come out with the ultimate Craig Fraser SkullMaster Set. It contains every Artool SkullMaster Signature Series template every designed by Craig Fraser and features his limited edition Skullduggery template. Each set is numbered 001-500, includes a signed Certificate of Authenticity, and comes in a top grain , black leather etched binder. Once all of the Artool Limited Edition SkullMaster Series Sets are sold, Skullduggery will cease to exist! !